Choosing the right cutting board for your kitchen needs careful consideration. As one of the most essential tools for food preparation, the price of your cutting board is not the only factor that matters. The size, thickness, material, maintenance, durability, safety, and sanitation all play an important role when it comes to your choices. It is recommended that you need to have at least two cutting boards: plastic and wood. Whereas the plastic variety is preferred for raw meat, wood products are best for slicing fruits and vegetables. Wood types are known for being less likely to be scarred by your cutting tools; you can even use them as stylish plates for the bar! For your convenience, plastic boards can be placed inside a dishwasher for cleaning, while wood boards need to be hand washed with mild detergent and water. With so many options available in the market, it can be difficult to find the right one for your kitchen. This comprehensive guide, complete with the key features, pros, and cons of ten top-of-the-line cutting boards, will help you make an informed choice. No chef’s station is complete without the perfect set of cutting boards that can meet all the demands of sanitation and varied food preparation procedures. Since not all products are created equally, you need to know the type of cutting board that will best suit your budget, prepping and cooking habits, and even style. Depending on the kind of food you are planning to prepare, and the knife you are using, there are cutting boards that are designed for specific purposes, from light dicing and mincing to heavy-duty chopping. Cutting boards with handles offer easy transportation of ingredients from your prepping station to the stove. Those with grooves on the sides provide spaces that will collect juices from raw meat, vegetables, and fruits. Antimicrobial wooden boards are also available to ensure cleanliness and safety. For best results, you may need separate pieces to avoid dangerous cross-contamination when chopping meat and dicing vegetables. Furthermore, if you are interested in something attractive, there are stylishly made boards that will complement the look and feel of your kitchen. With that said, there are indeed plenty of things that make each cutting board unique. To save you time in searching, and to make it easier for you to narrow down your choices to the product that will definitely suit your preferences, here is a list of the 10 most outstanding cutting boards that are worth adding to your kitchen essentials. Plastic: Made from polyethylene (PE) or high-density polyethylene plastic (HDPE), this type is the most recommended cutting board by professional chefs. It may not come with inherent antimicrobial properties, but it can take harsher cleaning methods, such as rinsing them with bleach and other disinfectants. For your convenience, you can wash them in the sink or run them through the dishwasher. Although it is prone to easily have knife marks, a plastic cutting board can handle sharper knives and heavier chopping, and is perfect for cutting pork, beef, and other raw meat. Wood: Unlike the plastic variety, wood contain natural antimicrobial properties. It is also self-healing when it comes to knife cuts and scores. The durability of wooden boards depend on the type of timber used, the tightness of its grain, and its pores. Teak, maple, and beech are great choices, as their resins prevent warping, fungi growth, microbes, and moisture. To make wooden chopping boards last long, you need to regularly maintain them with edible mineral, and wash them by hand. Your knives will also be sharper as wood doesn’t dull them. 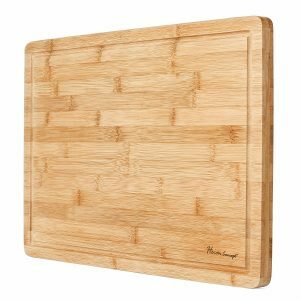 Bamboo: Bamboo is known as the most sanitary type of cutting board due to its ability to absorb less moisture. Thus, bacteria It is also the most environmentally friendly, since this hard grass can be grown and harvested without chemicals, and is a renewable and sustainable material. Typically, this type of cutting board needs to be primed and maintained with mineral oil to avoid splitting. Attractive, easy to wash, and can naturally close up knife grooves, a set of bamboo cutting boards can also serve as a stylish kitchen and bar companion. Glass: Easy to clean and low maintenance, you can wash glass cutting boards by hand or dishwasher. However, they are not as kind to knives as the other types due to their tendency to wear the edges. Steel: Cutting boards made of steel has the advantage of being durable, heat resistant, and easy to wash, but they also have the tendency to damage knife blades like the glass types. Rubber: Rubber pads are becoming popular cutting boards in restaurants. They are priced as much as high-quality wooden boards, and they can also withstand chemical disinfectants. Unlike other cutting boards that require a piece of wet cloth for stability, rubber ones are heavy enough to prevent slippage. Silicone: Silicone cutting boards are heat-resistant, contains antibacterial and self-healing properties, and are blade-friendly. Maple: The naturally attractive Hard Rock Maple or Sugar Maple is considered as “the workhorse of the maple family”. The dense and solid wood makes it resistant to shock and damage, offering durability and cost-efficiency. It is also known as the most popular wood used for cutting boards. Native to North America, this tree species is a renewable resource, abundant throughout Canada and the upper Midwest of the United States. Aside from its sustainability, maple is certified to be clean for kitchen use, approved by the National Sanitation Foundation (NSF). Like other wood options, it also inhibits harmful bacteria through a process known as capillary action, which absorbs the bacteria, cuts off the microbes’ oxygen supply, and killing them in the process. End Grain: The gorgeous, distinctive checkerboard pattern of end grain cutting boards isn’t only meant for aesthetic purposes, but also for longevity. Because the grain runs vertically, instead of the common horizontal style, the design actually makes this type of cutting board more durable, and gentler on your knives’ blades, even the sharpest ones. When you cut on the surface, the grain splits apart. When you lift your blade, the fibers simply fall back into their place. This closing action makes the material self-healing and scratch-resistant, thus, cutting and chopping only leave fainter marks on end grain boards compared to other surfaces. Butcher Block: This type of cutting board has been used for centuries. A butcher’s block is a piece of assembled maple, teak, or walnut wood that has been invented for heavy-duty and high-demand chopping, typically used for cutting large chunks of meat in butcher shops and meat processing plants. It has also become popular for food preparation at home, with many butcher blocks available on the market. They are bigger and heavier than other cutting boards. Aside from the weight and size, they also vary in the kind of material used; some are made of end-grain, while others are from edge-grain. If your food requires a lot of quartering, filleting, chopping, and deboning, a butcher’s block is highly recommended; other cutting boards may not be able to handle the force that these tasks entail. Personalized cutting boards: As the name suggests, it can be made from any kind of material: bamboo, maple, and more. This type of cutting boards is great for gifts for any occasion because they can be customized to fit your style, demands, and personal preferences. Some of the things you can do to individualize your cutting board is by monogramming or engraving words or names on it. What makes this type of cutting board more valuable is that they are also usually hand-crafted to fit your needs. Personalized, they can have sentimental value as well. Slice, mince, dice, chop, and carve any type of ingredient with this beautiful bamboo cutting board, butcher block, and serving tray! Made from organic Moso bamboo, this all-natural product has inherent antibacterial properties that inhibit the growth of harmful microbes, and prevent staining and odor. It also includes a lifetime warranty. You don’t have to hide this beauty away in a cupboard – why not flaunt its elegant design? 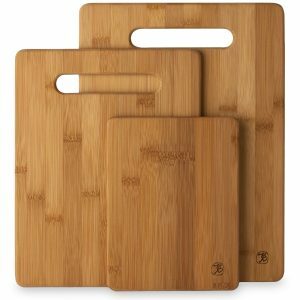 This top-of-the-line antibacterial and all-natural cutting board is crafted from only the finest premium Moso bamboo. What sets it apart from other wooden products is that it can survive heavy-duty knives, such as meat cleavers, so you can use it as an eye-catching butcher block. You can even use it as a serving tray when entertaining guests! 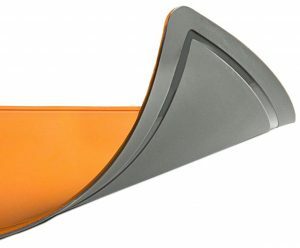 Its stylish two-toned look also makes it an artsy kitchen accessory and a lovely gift to your family and friends. This Uniware cutting board is perfect for chefs who puts health as their top priority. It comes in vibrant lime green, and its versatile working space allows you to cut small to large ingredients. Since Microban is the most reliable bacteria-prevention product, this cutting board is less likely to obtain stains and odor from microorganisms. Plus, it’s ultra durable. 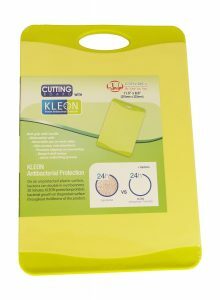 Want a plastic cutting board that already has antimicrobial properties? This cutting board is fortified with Microban to provide an extra layer of protection from harmful bacteria. You don’t need to hand wash this cutting board; just place them inside the dishwasher for effortless cleaning. It is ultra durable that it can last for a lifetime – a worthy investment that is a great addition to your kitchen tools. 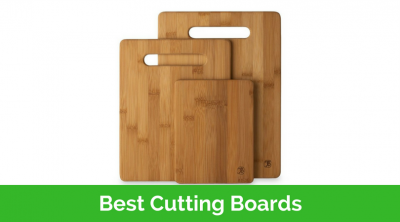 Aside from having the great qualities of a bamboo cutting board, you don’t need to own two or more cutting boards for separate slicing tasks with this product. 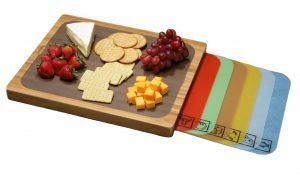 This beautiful bamboo board houses 7 vibrant, BPA-free cutting mats, which you can simply switch out and place on the surface area whenever you need to chop, dice, mince, or slice various ingredients! Avoiding cross-contamination has never been this easy. 4 rubber disks secure your board in place. The 7 color-coded mats will save you time; whenever you need to cut a different type of ingredient, just place the mat into the dishwasher and get another one to use! Save space – the mats can be safely stowed inside the board’s built-in storage compartment. Bamboo board needs to be periodically conditioned with mineral oil. 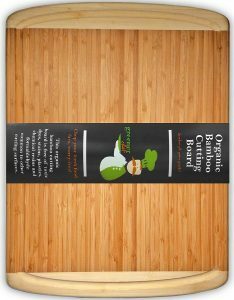 What other bamboo cutting board comes with 7 lovely mats? Aside from having a large surface area for working, you can dedicate one mat for one food group to avoid cross contamination. These vibrant mats can also be used for transporting and serving meat, vegetables, seafood, pastries, bread, poultry, and more. This innovative TPU cutting board has all you need for heavy cutting tasks. With two color-coded sides, this design allows you to dedicate a separate surface for slicing, dicing, mincing, and chopping different types of ingredients to avoid cross-contamination. This cutting board made from scratch- and heat-resistant TPU materials won’t disappoint when it comes to handling various food prepping procedures. For sanitation, you can choose to place it inside the dishwasher or pour boiling water over it, since it can handle temperatures as hot as 300° Fahrenheit. If you have a lot on your plate in the kitchen, its large working surface and two sides will give you the space you need to cut all kinds ingredients without risking cross-contamination. It is also good for food safety, as it is microbial, and has juice grooves to prevent leakage of liquids, keeping your station clean and free from harmful agents. A great addition to your kitchen, this Heim Concept Quality cutting boards are strong and durable while being lightweight. Made from the highly sustainable Moso bamboo, this board is not only attractive, but it also has antimicrobial properties for food safety. The grooves prevent juices from the dripping, helping you keep your kitchen counter free from harmful bacteria. Want to serve bread, cheese, and pastries? Just flip the board and place the treats on the smooth side. The Heim Concept embodies durability, strength, versatility, convenience, and environmentally-sound practice. A bamboo cutting board with liquid grooves, you will save time cleaning your station as it prevents juices from dripping on your counter. It is also easy to wash – just rinse it with soap and water, and air dry. Bamboo is known to be resilient, good-looking, and antimicrobial. It is also self-replenishing, and is one of the most renewable resources in the planet. All the qualities of the hard grass can be found in this Zenware 3-Piece Triple-Ply set. If you want a chopping board that is not only functional but also hygienic, tasteful, and eco-friendly, then this bamboo set is for you. Don’t be fooled by this lightweight 3-Piece Dutis® Cutting Board Set; it is durable, will not warp when cleaned in the dishwasher, and will not dull your cutting tools. Made from nonporous and odor-resistant plastic, the pieces come in small, medium, and large sizes to give you room for freedom and flexibility when cutting fish, meat, fruits, and vegetables. They are also equipped with drip grooves that will take care of the liquids from your ingredients. The assorted sizes make them perfect cutting boards for a cook who likes to experiment with different dishes. Investing in these high quality boards is worth the price; not only will you have three separate boards for avoiding cross-contamination, but you will also have the convenience of having lightweight cutting boards that you can easily transfer between stations. Be ready for any slicing, mincing, chopping, and dicing task with this set of Counterpart cutting mats. 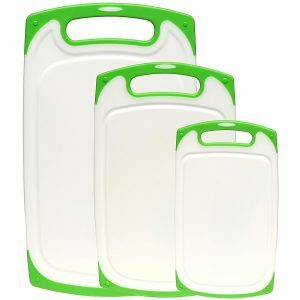 With four vibrant colors and adorable food icons, this set lets you avoid cross-contamination the fun and colorful way. Use the blue one for fish, red for beef, yellow for chicken, and green for veggies. They are also flexible, allowing you to roll them up to save storage space, or even use them as a funnel to pour contents without spilling the ingredients. Setting a cutting board for a specific food type is easier with the icons and color coding. Transfer ingredients easily by rolling these flex mats. It doesn’t have juice grooves for retaining liquids. With icons for fish, chicken, beef, and vegetables, you will always know where to safely chop, slice, dice, and mince your ingredients. 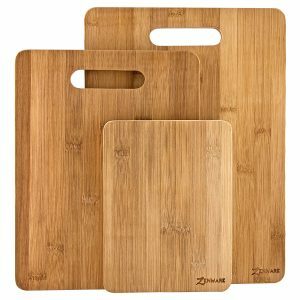 Like wood products, these cutting boards has antimicrobial properties due to its Micro ban protection – perfect for the health-conscious individual! Prepare all sorts of dishes with this durable OXO Good Grips cutting board. 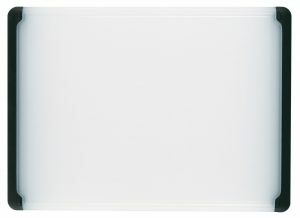 Designed with a white surface and black sides, this cool, clean board has juice grooves for retaining juices. To avoid cross-contamination, you can use the grooved area for chopping raw meat, and the solid side for slicing vegetables. It is easy to wash as it is dishwasher safe, and is resistant to odor. Made from durable polypropylene, this cutting board won’t dull your cutlery or be easily scratched by them. Plus, the handles provide a good grip when transferring ingredients from one place to another! The size offers flexibility for any cutting task. The juice groove takes care of the liquids from raw meat. Because it is odor resistant, they will always smell fresh after washing. There’s no need to place a damp cloth to stabilize the board when cutting; its nonslip capability prevents accidental slips! With no inherent antimicrobial properties, you may need to disinfect them with chemicals. This cutting board has everything for the creative and practical cook. Juice grooves for collecting raw meat juices? Check. Handles for comfortable carrying? Check. Flexible enough to prep both meat and veggies? Check. Dishwasher safe? Yes. What more can you ask for? Why only have one, when you can have three? The three pieces provide variety and flexibility. If you need a board for slicing large ingredients, such as meat, you can depend on the 9 ½” by 13″ to do the job. For medium-sized food, you can prepare them using the 8 ½” by 11″ or the 6″ by 8″ boards – perfect for fruits and vegetables. Having a cocktail party? You can serve cheeses and breads in all three. They are best for preparing vegetables, and can also be used for crackers, cheese, and bread. They can serve as a stylish cocktail board with their polished look and feel. The three sizes offer flexibility when it comes to preparing different types of food, and having multiple pieces also prevent cross-contamination. You don’t need to buy chemical disinfectants; you can easily sanitize them with soapy water. Because they are made from bamboo, one of the most renewable resources in the world, they are kind to the environment. To prevent warping, the bamboo boards need to be oiled regularly for them to last longer. These bamboo beauties look great, are environmentally friendly, they don’t get scratched easily, and they prevent the retention of harmful bacteria. Chopping boards indeed come in so many different types, sizes, and properties. Carefully considering each product will help you find the perfect board for your home cooking or profession, whether you are looking for a bamboo cutting board, a plastic one, or otherwise. This guide features only the best picks for your convenience, budget, safety, and peace of mind.